The Boston Massacre Marker is a memorial to the victims of the Boston Massacre, which took place on March 5, 1770 in front of the old State House during the American Revolution. 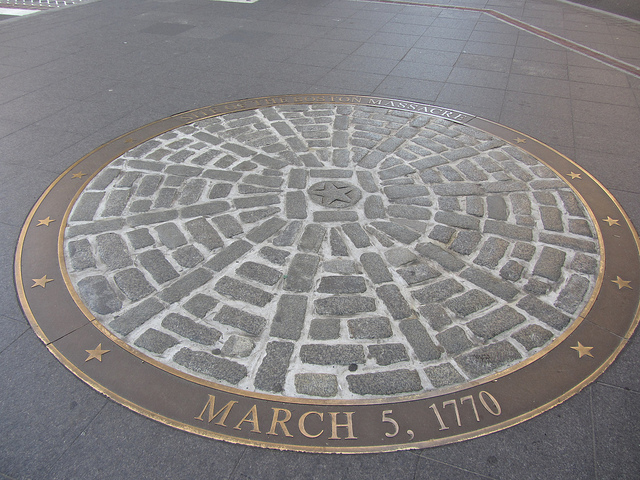 The marker, which is made up of 13 rings of cobblestones and a center stone marked with a star, had been on a traffic island in front of the Old State House for decades but in 2011 it was removed and placed at its current location at the intersection of Congress, Devonshire and State Streets, which is on the sidewalk in front of the Old State House. The sidewalk there was also expanded to make room for the memorial and the stones were placed inside a bronze ring to make it more noticeable. This is not actually the original location of the marker, nor is it the actual site of the Boston Massacre. The marker was originally placed on the corner of State and Exchange street in 1887 to mark the exact spot where one of the victims of the Boston Massacre, Crispus Attucks, fell dead after being shot by British soldiers. The city government in 1904 apparently was not as concerned with doubt and accuracy and removed the stones to allow construction of the Boston subway underneath and then moved them to a nearby site where another victim, James Caldwell, had died. During the 1960s, the city underwent an urban renewal that led to the relocation of many streets, during which the memorial was moved to a traffic island in front of the Old State House. The stones were removed again in 2011 in order to upgrade the State Street subway station underneath and were placed at its current location at the intersection of Congress, Devonshire and State Streets. 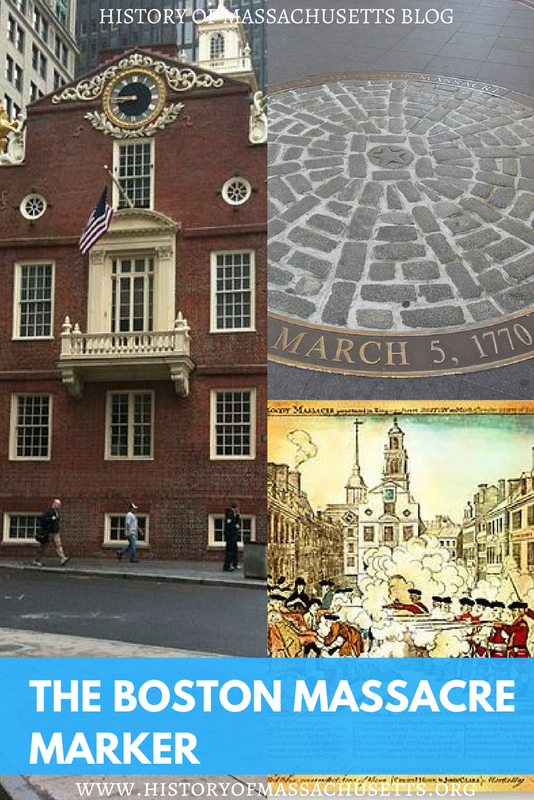 The Boston Massacre occurred on the night of March 5, 1770 when five people died after British soldiers fired into a crowd of people outside the state house. The victims were Crispus Attucks, Samuel Gray, James Caldwell, Samuel Maverick and Patrick Carr. Anti-British sentiment was high at the time due to the large presence of British soldiers in the city. A group of citizens had gathered outside of the state house, which was the seat of the British government at the time, that night and an argument ensued between one person in the crowd and a guard standing outside. After the guard struck the citizen, the group started to throw snowballs, sticks and rocks at the guards. Chaos ensued and shots were fired into the crowd. The attack was an accident but it further damaged the relations between colonists and the British government. A trial was held for the eight soldiers involved, with John Adams serving as their lawyer, and all but two were acquitted of murder charges. The two that were convicted were physically branded with a “M” on their right thumb for manslaughter. They narrowly escaped the death penalty by invoking the “benefit of the clergy” – a medieval law that exempted clergymen from secular courts. To be eligible for the benefit of the clergy, they had to prove they could read Psalm 51, verse 1. The branding on their thumbs was to prevent them from invoking the benefit of the clergy again. The name ‘The Boston Massacre” is only a recent nickname. Paul Revere nicknamed it the Bloody Massacre in King Street (the former name of State Street) after the deaths and during the early 1800s it was known as the State Street Massacre. The Bostonian Society. Proceedings of the Bostonian Society at the Annual Meeting, January 10, 1882. Old State House Order of Directors, 1883.